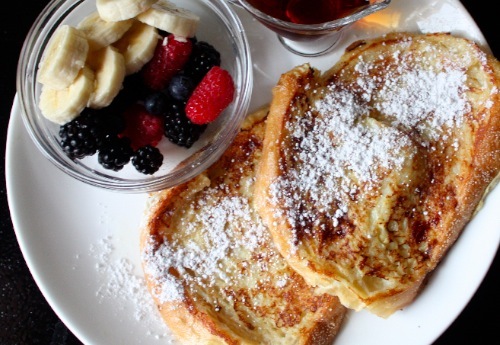 When was the last time you made French toast? I haven’t made French toast in many years, and the last time I ordered it at a breakfast spot was over 3 years ago, before I ever even met my husband! That had to change, and fast. I love French toast, but I hate the way I used to feel after… food comas are no fun in the morning, and I prefer to have an energizing breakfast that will last me all morning. To solve this issue, I lightened up my classic French toast recipe a bit and paired it with lots of fresh fruit. I did not have good whole wheat bread on hand, but next time that is what I would use. I need to stock up on Nature’s Pride breads! 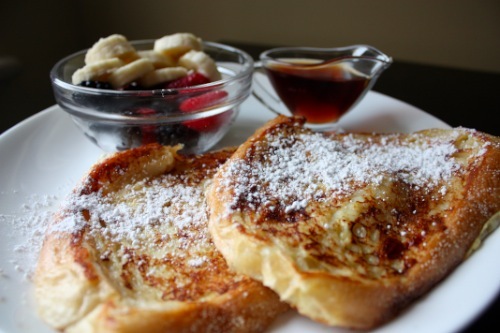 When I was little my mom or my auntie would sometimes make french toast for us kids. They would use plain square white bread and makes piles and piles of french toast. We ate each piece as it came out of the pan before it could get even a smidgen cold. I loved the fake maple syrup (Aunt Jemima’s!! ), but some of my cousins preferred the real stuff. All of us would douse our french toast in as much powdered sugar and syrup as we could handle, and each bite was washed down with a cold sip of milk. No french toast breakfast was complete without my cousin Rawan proving to us that she could stuff a whole piece in her mouth in one bit! Crazy! I love food memories, don’t you? While this french toast does not come with a cousin ready to show her french toast talents, it is a simple yet fancy breakfast dish that everyone should know how to make. You can impress family, guests, and even yourself! For another fun breakfast dish that even your kids will love, check out these banana bites. My friend sent me the link and I have been thinking about them since. Serve with your choice of: fresh berries, banana slices, maple syrup, powdered sugar, or even peanut butter! Heat a nonstick pan over medium heat and add half the butter. Meanwhile, whisk together the egg white, skim milk, vanilla extract and salt. Note: the salt brings out all of the other flavors. Soak each piece of bread in the mixture for about 15 seconds. Be sure that both sides are covered in the liquid. Drop one piece in the pan. Flip after 3 minutes. Remove when golden brown on both sides. Add the rest of the butter and repeat with the second piece of bread. If you are like me, enjoy with banana slices, fresh berries, and a bit of toxic sugar free maple syrup. Already ate breakfast and need an inspiration for lunch? 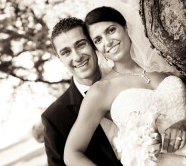 Check out some of my favorite Athenos feta recipes!! My husband thinks I’m crazy when I put peanut butter on french toast or pancakes…he just doesn’t know what he’s missing! This recipe looks great! I love french toast too, but like you I often end up in a food coma afterwards! I have made it with wheat bread and eggs, but it just isn’t the same. I save french toast for special breakfasts! I need to try these! I always avoid french toast because I hate how I feel after eating them. Yours looks gorgeous! i love french toast, i just made a giant batch of it for myself and a bunch of friends during a weekend trip to new hampshire. you forgot one important french toast ingredient in the eggs after you beat them… cinnamon! I just made it not that long ago, but used Ezekiel cinnamon raisin bread to make it healthier. Not quite the same, but still a good breakfast. My husband LOVES french toast, we just had it last weekend actually! I’m in love…le sigh. I was actually thinking of french toast for tomorrow morning and this just might be fate telling me to go for it! i’ve never had french toast! but i think i will try with your recipe! I love challah french toast mmmm!!! Yours looks amazing too! Hi! I just stumbled across your blog and was excited to see that you made french toast this morning! I DID TOO–>Kahlua soaked Banana Nut Stuffed French Toast! Oh so good! It sure was a nice treat! I love challah bread for french toast! I bet it was delicious! I’m with you, hate the way the unhealthy french toast makes me feel after eating it, can’t wait to try this one! I’ve never really had french toast until I came to America, though. The “french toast” in Singapore was just bread dipped in egg and then fried. Clearly I am a naughty eater because it is not that hard for me to remember all the times I’ve eaten french toast or made it at home. I have to say, when I make it I usually go for white bread or at the very least, a bakery made whole grain bread. i’ve just found that packaged whole grain breads never seem to give me the texture I’m looking for. I also saw your comment on ELR regarding her format change and wanted to comment because I 100% agree with you. I think everyone has to handle it in her own way and that it doesn’t have to be black or white. In my opinion being selective, honest and serving things up in a way that is informative rather than an infomercial is key. I don’t think all bloggers who accept products are bad or that all those who turn them down are good. I just wanted to say I respect your honesty. I think it can sometimes be challenging to be honest sometimes in the comments on blogs so I respect and agree with your point of view and always feel you’ve been classy about the products you partner with. Just wanted to share my two cents since i feel our philosophies are similar. @Kelly, Thank you SO much for your comment. I really appreciate it! Ya know, Sabrina, I haven’t had French Toast in ages. This looks absolutely beautiful. I have great childhood French toast memories. My dad used to make us French toast before school sometimes (seriously, what a treat!!) and I would DRENCH it in good old Aunt Jemima. I even remember getting in fights with my brother about syrup – he was completely opposed and had his toast “dry”, while I was obviously the world’s biggest advocate and could not understand his preference in any way. It was so great meeting you this weekend at teh HLS – great job on your preso! That french toast looks crazy good, yum.